True or False Pope: DID GOD KILL FR. GRUNER FOR RECOGNIZING FRANCIS AS POPE? FR. KRAMER SAYS YES. DID GOD KILL FR. GRUNER FOR RECOGNIZING FRANCIS AS POPE? FR. KRAMER SAYS YES. If you have followed our debate with Fr. Kramer, and thought he could not discredit himself any more than he already has, think again. As one person recently noted, it appears that Fr. Kramer has gone completely mad. , and is not operating with his full mental faculties. Mr. Sullivan: Why would Fr. Gruner, only one week before his death, publicly call Francis, Pope Francis, if he was 100% sure he was an Anti-Pope? Posted August 9, 2016 at 1.01am. Fr. Kramer: I don’t want to be too harsh in my judgment, but Fr. Gruner had one opinion, but dissimulated about the other -- … (Posted August 9, 2016 at 1.08am, emphasis added). Mr. Sullivan: ? (Posted August 9, 2016 at 1.08am). Fr. Kramer: Yes, Robert Sullivan you heard me. I don’t want to say more in judgment. Fr. Gruner singlehandedly informed the whole world about the request of the consecration of Russia. When that happens, the Church and the world will have a great debt of gratitude to Fr. Gruner. Nevertheless, he dissimulated about “Pope” Francis. He knew better, but still postured as though Francis were the pope. God intervened. I do not wish to take anything away from the accomplishments of Fr. Gruner regarding the work for the consecration of Russia – but in the divine scheme of things, he did not adjust to the changed situation in the Church . . . (Posted August 9, 2016 at 1.08am, emphases added). Mr. Sullivan: And just to be clear are you saying “God intervened” by taking Fr. Gruner out of this world, because, in your opinion “he dissimulated about ‘Pope’ Francis. …” (Posted August 9, 2016, 1:32am, emphasis added). John Salza: Folks, there you have it. According to Fr. Paul Kramer, God killed Fr. Gruner as a punishment for publicly recognizing Francis as Pope. He was asked point blank if this is what he meant and he did not deny it (“Quod scripsi, scripsi”). So according to Fr. Kramer, God took the life of one of his most faithful priests, loved beyond words by Jesus Christ and Our Lady, because this priest submitted to the public judgment of Christ’s Church on who is Pope! Only a crazy person would make such a statement, and do so publicly. Let’s be clear about the implications of Fr. Kramer’s statement, even beyond the judgments we can draw about his psychological state of mind. Kramer claims that Fr. 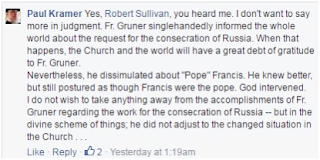 Gruner “dissimulated” (he says it two times) about Francis being Pope. That is, he claims that Fr. Gruner did not really believe Francis was Pope, but spoke and acted like he did believe he was Pope. In other words, by accusing him of “dissimulation,” Fr. Kramer accuses Fr. Gruner of being a public liar and a sinner. As St. Thomas explains, “is it contrary to truth to employ signs of deeds or things to signify the contrary of what is in oneself, and this is what is properly denoted by dissimulation. Consequently dissimulation is properly a lie told by the signs of outward deeds. Now it matters not whether one lie in word or in any other way, as stated above (110, 1, Objection 2). Wherefore, since every lie is a sin, as stated above (Question 110, Article 3), it follows that also all dissimulation is a sin.” Again, by accusing him of “dissimulation,” Fr. Kramer has accused Fr. Gruner of being a public liar and a sinner, since Fr. Gruner allegedly “signified the contrary” of what was in himself, namely, he believed that Francis was not the true Pope, even though “by the signs of outward deeds” Fr. Gruner spoke and acted as if he believed Francis were the true Pope. And note well the additional implications of Fr. Kramer’s accusation against Fr. Gruner. Scripture condemns lying as it does other mortal sins which merit eternal damnation. As the Catholic Encyclopedia states, “In places almost innumerable Holy Scripture seems to condemn lying as absolutely and unreservedly as it condemns murder and fornication.” Indeed it does. In the Apocalypse, Christ Himself warns that liars will share the same eternal fate as idolaters and other wicked sinners when He says: “But the fearful, and unbelieving, and the abominable, and murders, and whoremongers, and sorcerers, and idolaters, and all liars, they shall have their portion in the pool burning with fire and brimstone, which is the second death” (Apoc. 21:8). Thus, by accusing Fr. Gruner of being a public liar, Kramer is suggesting that Fr. Gruner, who persevered in his “lie” until death (a death Fr. Kramer claims God inflicted on him for his “sin”), may indeed be burning in hell. Now, Fr. Gruner not only knew, but also preached to the faithful of the absolute necessity of recognizing the true Pope and submitting to his judgments in all things lawful. Fr. Gruner would often refer to the Church’s dogmatic definition “that it is absolutely necessary for salvation that every human creature be subject to the Roman Pontiff.” He did so because he himself was falsely accused by his enemies of not being in subjection to the Popes for pointing out their failures to consecrate Russia and reveal the Third Secret of Fatima, and he wanted the faithful to understand the difference between being “subject to the Roman Pontiff” while, at the same time, “resisting” his errors. Thus, Fr. Gruner no doubt considered the public acknowledgment and submission to the true Pope a most grave matter of salvation. Indeed, this is precisely why Fr. Gruner taught the faithful that they must be both in submission to the Popes while also resisting their errors and omissions regarding the Message of Fatima – so they could save their souls. Consequently, it is certain that Fr. Gruner rejected Sedevacantism and the opinion that one can declare, by his own private judgment, that the elected Pope is an antipope, contrary to the public judgment of the Church. This also means that Fr. Gruner rejected the erroneous theology of Fr. Kramer. Fr. Gruner suffered more injustice, lies, and calumny during his priestly life then most men would be able to endure. And, now, even after his shocking and untimely death, he is still having his reputation publicly attacked by the likes of Fr. Paul Leonard Kramer, who claims that God struck him dead for being a public liar. Fr. Paul Kramer should be shunned and denounced by all Catholic faithful, at least until he publicly retracts and repents of his malicious and reckless accusations against one of the greatest and most influential Churchmen of the past century, the Fatima priest, Fr. Nicholas Gruner. May God have mercy on Fr. Kramer. ST, II-II, q 111, a. 1. See also 1Tim. 10 and Titus 1:12. Pope Boniface’s Unam Sanctam (November 18, 1302). The Catechism says: “A lie consists in speaking a falsehood with the intention of deceiving. The Lord denounces lying as the work of the devil…” (CCC 2482). St. Thomas teaches that when dissimulation is in the form of hypocrisy, it is a “mortal sin” when “it is contrary to the love of God or of his neighbor.” ST, II-II, q. 111, a. 4. St. Thomas explains that this would happen if the man simulated to “obtain ecclesiastical preferment” or “any temporal good in which he fixes his end.” Ibid. This is very sad news. I have recently exchanged emails with Fr. Kramer in defending the Salza/Siscoe position and calling on Fr, Kramer to reflect on his wild claims and conspiratorial theories. It was to no avail. Fr. Kramer, God help him, has truly lost the plot. I just hope for his sake that it is some kind of madness that he is not responsible for. But I suspect intellectual and spiritual pride, a malady common to all those who joined the so-called "Resistance" against the SSPX. There is also no little anger in these people, and as St. James tells us: "The anger of man worketh not the justice of God". Pride is fatal to both mind and soul! Good article. God bless you Father Gruner--- Pray for us. I miss you.